In 2010, LEARN Science and Math Club launched its high school robotics program. 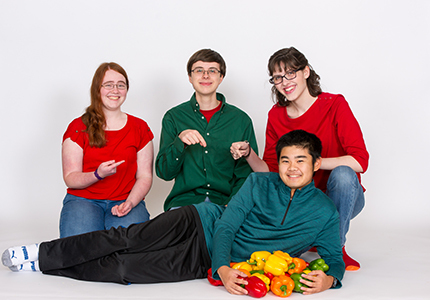 Our rookie team, The Red Hot Techie Peppers, had a bang up year – winning the 1st Place Connect Award and the 2nd Place Inspire Award at the Southeast Missouri State Qualifier and the 1st Place Motivate Award at the Missouri State Championship. The team's success has continued throughout its history, earning honors year after year. If you’ve not heard of FIRST Robotics, you’ve missed out on one of the coolest, hands-on learning platforms for building math and science skills. FIRST makes computer science and engineering “hip” by building a sports-like, team-based competition around robotics. Hundreds of thousands of kids from around the world get together and build robots that solve weird, exciting and difficult challenges every year. You don’t have to be a super-geek to get involved. If you’re interested in graphic design, marketing, computer programming, computer-aided design or engineering, we’ve got something for you! Our FTC team invites new members to join at the beginning of each school year when FTC announces its new challenge in early September. It’s like waking up on Christmas morning to dozens of packages under the tree. So, it’s a great time to dive in and build amazing ‘bots. Whether you choose to join in the fall or spring, you will learn a ton, have a blast and make lots of great friends. And, there are so many benefits! Read on to learn more. Win Great Scholarships – Last year, over $50 million in scholarships were given to members of FIRST robotics teams. We intend for our kids to win some of that money. Every year for the last fourteen years, our robotics teams have ranked among the best teams in our state, region and even internationally. Attract College Recruiters – Colleges seek out kids who’ve participated in FIRST robotics programs because they know these kids are dedicated, logical and creative problem-solvers. Develop A Strong Understanding of Technology – Even if you don’t plan to be an engineer, you will benefit from knowing about technology. Our program will teach you sound engineering principles plus strong computer, project management, mechanical and electrical engineering skills. Make Friends & Have Fun – Our teams have a BLAST! We play together, work together and travel together. Our kids have traveled to regional competitions, to Nationals and to the World Festival. We have had team exchanges with kids from Germany and Florida. And, we host lots of parties and field trips. We think everyone learns best when they’re having a good time. Parents play a pivotal role in this club. We strongly encourage parents to get involved and share in the group’s planning and administration. We do understand, though, that sometimes life’s competing demands don’t make it possible for everyone to get involved; so, we offer a drop-off program for parents who can’t attend the Club’s meetings. In recognition of the great contribution parents make to the Club, the cost for those who participate is lower. Dues are $65/month for kids whose parents participate in Club and $130/month for kids whose parents who do not. To keep dues low (dues cover only a fraction of the team’s costs), team members also have a fund-raising requirement. We host a kick-off meeting every Fall to introduce prospective new members to the team and what we do; see below for the details. We’d love for you to come and visit. To ensure that we have the space and staffing to make this event a pleasure for all who attend, please register by clicking the Register Now button on this page. Intro Meeting for New Members in early September. Regular meetings on Monday and Thursday evenings, 9/13 through 5/15 & one Saturday per month. Dues are $65/month for kids whose parents participate in the Club and $130/month for kids whose parents who do not.